We have been dealing with panorama shooting for 6 years already. Over this period, we have shot many interesting world cities: New York, Amsterdam, Kuala Lumpur, Sydney, Miami, Las Vegas, Rio de Janeiro, Dubai, Los Angeles, etc. However, despite our greatest efforts, we haven’t still managed to shoot Moscow — the city, where we live. The thing is that flights over Moscow are prohibited, except for rescue and police helicopters. However, we found this opportunity in the Spring of 2010. It all began with the military fly-past over Moscow. In May, we managed to get on board of a helicopter, which flew over the city during the military fly-past rehearsal dedicated to the 65th Anniversary of the Great Victory. 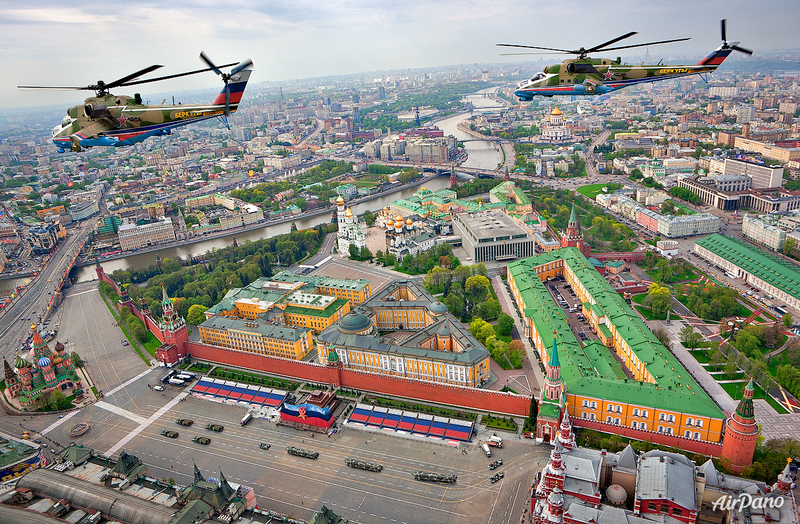 While following its route, the helicopter flew over Red Square and we got a chance to do a unique shooting session over the Kremlin. Shooting conditions were extremely difficult: the helicopter flies over Red Square in 5 seconds at 250 km/h; no one in the world has ever done a spherical panorama shooting in such conditions per one flight over the shooting point. Unfortunately shooting conditions in the helicopter cabin turned out to be even more difficult than I had expected, and when we took off, I decided to refuse an idea of shooting a spherical panorama in Moscow over the Kremlin, since there was a high risk just to spoil it all. Even now, when we learned how to do this, I’m not sure, whether we would have managed to do what we wanted those days. So when flying over Moscow, we decided to do just an ordinary traditional shooting session. After all, and first of all, we are photographers and then panoramers. :) Finally, one of the photos taken by my workmate Sergey Semenov and showing the Golden Eagles flying over Red Square attracted lots of interest of viewers and for about a month was among top photos at Photosight.ru — one of the most popular Russian photo resources. However, when flying back from Moscow to the helicopter base, we had some free time, and I decided to try the spherical panorama shooting from the moving helicopter. We made about two dozens of trials using various techniques and finally managed to stitch one of the panoramas. Unfortunately, the weather was cloudy, and the landscape we were flying over was not much interesting, that’s why the panorama itself does not have any art value. However, in technical terms, this panorama became our great success, and we’re proud of these results. You may read a story about the shooting of this panorama at our website here. To view this panorama in original size, please go here.